CAMP HANSEN, OKINAWA, Japan — The 31st Marine Expeditionary Unit completed the first in a series of pre-deployment training events at Camp Hansen, Okinawa, Japan, June 28, 2018. The first step for the 31st MEU to prepare for an upcoming patrol of the Indo-Pacific region is Marine Expeditionary Unit Exercise. Also called MEUEX, it is designed to integrate each component of the 31st MEU – Battalion Landing Team, 2nd Battalion, 5th Marines; Marine Medium Tiltrotor Squadron 262 (Reinforced); Combat Logistics Battalion 31; and the 31st MEU Command Element – into a cohesive crisis response force capable of a diverse set of missions at a moment’s notice. MEUEX tests the 31st MEU’s capability to plan and launch a series of complex missions from the sea, ranging from limited combat operations to humanitarian assistance and disaster relief – with a target of six hours from orders received to mission execution, according to Col. Robert Brodie, the 31st MEU commander. For each component of the 31st MEU – the Ground Combat Element, the Aviation Combat Element, the Logistics Combat Element and the Command Element – MEUEX is a two week sprint to plan, rehearse and launch specific mission-sets in and around Okinawa, where the unit is based. For the Marine Corps’ only continuously forward-deployed MEU, MEUEX sets the pace at the start of each twice-annual deployment. It is an imperative first step, according to Brodie. 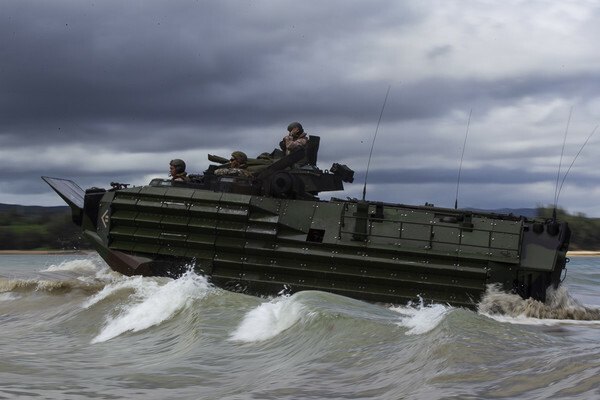 The 31st MEU, as a forward-deployed unit, is constantly on call to address crises throughout the entire Indo-Pacific region, stretching from Australia in the south to Mongolia in the north, and India in the west to roughly the Marshall Islands in the mid-Pacific. The vast area of responsibility features a wide array of terrain, climate, cultures and geopolitics. The 31st MEU must train to operate in everything from the jungle to deserts and mountains to coral outcroppings no higher than a few meters. They deploy with a large contingent of weapons, vehicles, equipment and personnel, aiming to be armed and equipped for any scenario, according to Maj. Jacob R. Godby, the 31st MEU’s assistant operations officer. While embarked, the 31st MEU partners with the U.S. Navy’s Amphibious Squadron 11 to form the Wasp Amphibious Ready Group. The Marines and Sailors who form the 31st MEU embark aboard the ships of the Wasp ARG, and focus on area presence throughout the region while partnering with regional nations to enhance security and build ties between militaries, according to Godby.